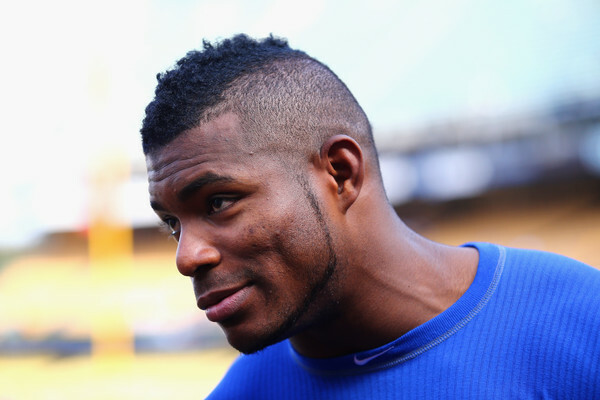 Whatever Yasiel Puig is selling, there’s something about it that Andrew Friedman isn’t buying. I thought that down the stretch, Puig got off the mat and answered the bell for the Dodgers in 2017. He was a lynchpin in an offense that had gone stagnant, a team that had gone flat, and he grinded out tough at-bat after tough at-bat in October towards the bottom of the lineup. All-in-all, I felt like it was the best baseball Puig has played in his career aside from his electric start to his career in 2013. But there are reports that the Dodgers dangled Puig in an attempt to acquire Jackie Bradley Jr. from the Boston Red Sox recently, and the Red Sox politely declined. Puig has been rumored so many times to so many places, and it’s never happened; it almost feels like destiny that he and the Dodgers die together at this point. We love Yasiel Puig. But there’s something that doesn’t meet the eye here. There’s something that is making the Dodgers want to move on from him when his value has relatively recouped itself for the time being. There’s certainly a reason behind closed doors that the Dodgers don’t want to try to see things through with a guy in his prime. It is one of several things. The Dodgers either believe his best baseball is behind him and he’s never really going to get better or peak (most likely scenario), or he does something that causes distraction and noise in the locker room (general certainty as well), or a combination of both. Either way, expect to see the Wild Horse in SoCal kicking out stable car windows at Chavez Ravine this spring once again, for the time being.